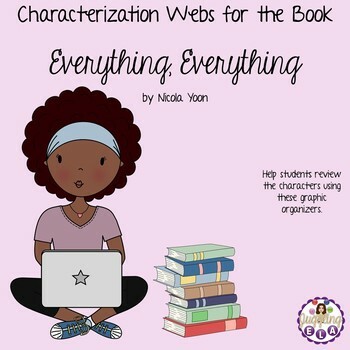 There are 13 characterization webs for the book Everything, Everything by Nicola Yoon included in this product. 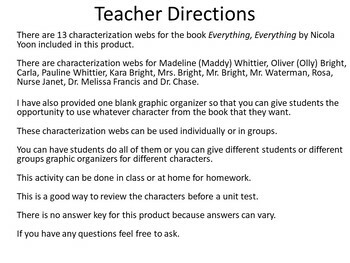 There are characterization webs for Madeline (Maddy) Whittier, Oliver (Olly) Bright, Carla, Pauline Whittier, Kara Bright, Mrs. Bright, Mr. Bright, Mr. Waterman, Rosa, Nurse Janet, Dr. Melissa Francis and Dr. Chase. 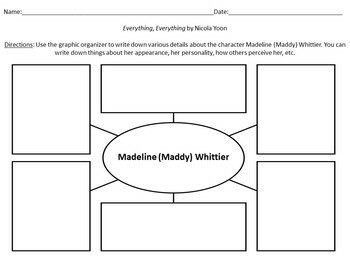 I have also provided one blank graphic organizer so that you can give students the opportunity to use whatever character from the book that they want. 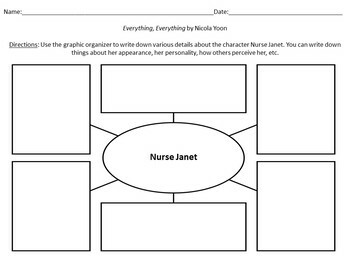 This is a good way to review the characters before a unit test.